*HOT* $10 coupon from Lane Bryant = FREE STUFF! 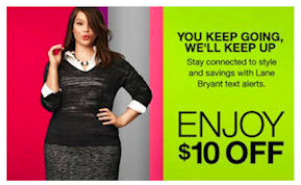 Text MOBILE to 23705 to get a code good for $10 off ANY Lane Bryant in store purchase! No minimum purchase required! The $10 off code should score you some free or super cheap items! NOTE: If you're a current subscriber you'll need to text message STOP to 23705 and then send the text message above. Valid for a limited time only.